It’s come back round to this time of year again, it doesn’t seem five minutes ago since we were clipping last year. It’s a job that has to be done, as you wouldn’t want to wear a woolly coat all summer long. The sheep do not lose their wool, so any that were missed last year off the moor have two coats on so they must be very warm! There is myself, my Dad and brother that clip the sheep. Also my cousin Steph helps dose the lambs if we are clipping when she is at home. The first lot of sheep that we did were half of the Masham twins. We clip all of the Masham ewes first as they have more rise in the wool than the horned ones. We have just started clipping the horned ones- as they are thinner sheep the wool hadn’t risen as much so they were harder to clip. My brother has just clipped one that managed to dodge us last year off the moor and its fleece is like a mat! My main job during clipping is sorting out the lambs and dosing the sheep if they need it. 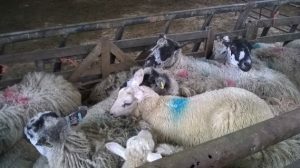 When the sheep are rounded up for clipping, they were dosed with a wormer medicine called Cydectin, as tests showed that they had worms. This is a different wormer that we would normally use because if we use the same wormer all the time, the worms can become resistant to it. Worms take goodness out of what the sheep eat meaning that the sheep don’t do as well, which causes the lambs to weigh less so we get less money for them. There are three different types of wormers and we try to change the one we use so we don’t have resistance. You can find out a worm count of the sheep by collecting muck samples and taking them to the vets to be tested. This way you find out whether you really need to dose the sheep as if you dosing them too often can lead to resistance. You can sometimes see the worms in then sheep muck if they are bad or just after you have dosed them, so it makes you feel like you have done some good. As well as worming, the lambs have pour on put on them to prevent blowfly strike. This is when the flies lay their eggs on the sheep and they hatch into maggots. We do this because if it gets very warm the lambs can get maggoted very easily if they have a slight bit of muck on them, so it helps prevent it and makes life a bit easier. 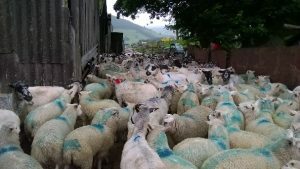 Whilst clipping the sheep it is the best time to see what the sheep’s bag is like as if it has been a cold time we have had quite a few with black bag (mastitis). This is when their bag goes wrong and they no longer have any milk in it and therefore can’t suckle lambs again next year so they get a red mark at the back of their head and when we spane the ewes and lambs, the ewes are sold. My dad and brother clip the most, but between sorting the lambs out and dosing the sheep I try to clip a few. My Grandad has the job of wrapping the wool. My dad and brother try to have a race to see who can clip faster, but my dad always wins though Luke is getting faster at clipping. I don’t try to race them as they go faster than me but getting some clipped is better than none is what I always think.